For a lot of us though, as Statista's Martin Armstrong notes, these dreams and expectations often don't quite match up with real life. 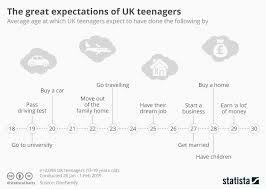 Regardless, how do the UK's teenagers today think their early adulthood will play out? According to a new survey commissioned by financial services provider OneFamily, the average teen expects to leave home at the age of 22, go travelling at 23 and bag their dream job by the time they're 25. The respondents predict things will start to get serious at the age of 28 when buying a home and having kids is on the agenda. As OneFamily points out, the final step on teens' roadmap - to be earning 'a lot' of money by the age of 29 - is perhaps the most unrealistic. 'A lot' was defined as £70,000, which according to Office for National Statistics data, is three times the average salary of a 30 year old in the country. But there's no harm in dreaming, is there?